This book's theme focuses on domestic abuse and what fuels the mental and emotional gears of it. In this book we're introduced to Cassie, a noted anthropologist whose married to Alex Rivers, a well-known and loved actor. From the outside their relationship seems "picture perfect" but as we delve into Cassie's memories we learn the disturbing, sad truth. 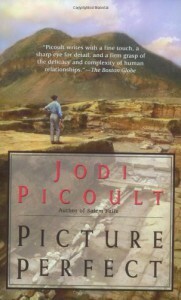 Jodi Picoult does an awesome job of evenly portraying both sides of this dysfunctional relationship. She showed how a sweet, unloved little boy grew up to be a man who channeled his hurts into rages, and how the little girl who took care of her drunk parent grew up to think that she could be there for someone no matter what. It would be nice if all abusive relationships could be so sweet and flowery as this one turned out to be and that violent men only struck out when they were hurting, but anyone whose been in one knows it's just not this way. But, nevertheless, this book is a page-turner that comes to, for me, a very satisfying ending and is one I highly recommend.